There are various nerve structures that can cause symptomatic conditions in the body due to several reasons. A few of the more common nerve disorders are presented here for you to explore and learn a little more about. 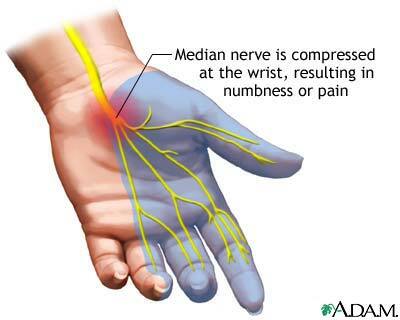 Carpal Tunnel Syndrome: This involves the median nerve, and some common complaints are pain, weakness, numbness especially the thumb thru long fingers. There can be night time pain as well. Initially treatments may include bracing at night, anti-inflammatory medicines, injections, and sometimes surgery. An EMG(nerve test) may be ordered to help detect the severity of this or any nerve syndrome. This photo shows the typical areas involved in carpal tunnel syndrome. 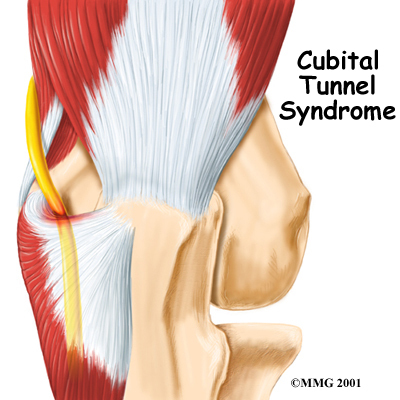 Cubital Tunnel Syndrome: This involves the ulnar nerve and typically involves pain, numbness especially the ring and small fingers. There may be associated weakness in the grip as well. Treatments include those listed previously. Surgery is an option to decompress the area involved which can be further assessed by an EMG. 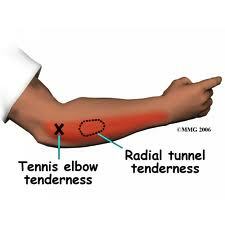 Radial Tunnel Syndrome: This entity involves the radial nerve and usually it becomes inflamed by the elbow and or wrist. The first results in pain and weakness of the wrist, forearm muscles, the second involves the only pain or numbness about or just before the thumb area of the wrist. Conservative therapy or surgery may be needed. An EMG may or may not be helpful. This is the area by the elbow typically involved.